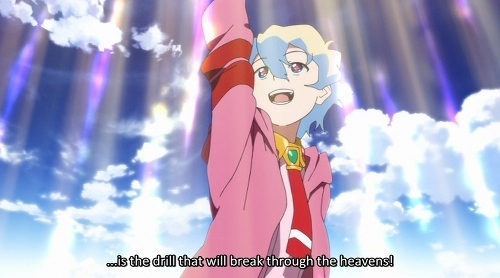 I've been watching Gurren Lagann for two weeks now, and I'm so thorougly absorbed in their universe. One of the great things about limiting yourself to one episode a day ^^. Plot: An epic 13 episode journey started by a boy and a young man in a subterranean village culminates in a final showdown between the fortresses of two of the generals, and the valiant crew of the Dai-Gurren. Victory is in sight, but can they comprehend what they've unleashed? Can I even comprehend it?! Narrator: Despite having one of the most powerful weapons in the fleet, and despite being given the biggest pounding yet, Yoko seemingly preferred to stay on the bridge of Dai-Gurren and narrate what was going on to us. Now that I think about it, often she didn't even do that, she just provided facial expressions while other bridge officers told her what was going on. Poor show Yoko ;). 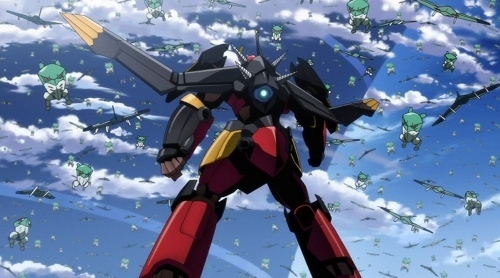 Tactics: Compared to previous episodes where an all-out offensive seems to be the winning ticket, the sheer number of enemy ships causes Simon to pull rank and fight them himself, relegating the defence of Dai-Gurren to the others. Art: Given the predominant theme of the episode was "blow evil ships up" we had quite a fireworks display. Mostly Gainax showed off their light effects, particularly when Gurren Lagann powered up to take on the millions of avian ships. Common sense: I know The Generals have their pride to maintain and didn't want to dignify these humans with too much firepower, but why didn't they use two of their fortresses in the first place? They could have crushed these silly little humans ages ago! Pride cometh before the fall. Technology: Sometimes a low tech solution is better than a more sophisticated one. When a gigantic Gunmen needs to traverse water, what better thing to arm oneself with than a giantic paddle? When communication lines are down, what better thing to use than a projector aimed at a swirling cloud of dust to attract attention? Friends: Having inspired other humans to the surface with their antics, at a critical moment (of course!) our heros are joined by an armada of friendly ships ready to assist in taking their enemies down. A good thing, given it seemed they had no hope otherwise. Nostalgia: Seeing Simon use tha late Kamina's passionate rallying cry was one thing, but to see Nia show that spirit was quite another. By the way, Nia is absolutely adorable, and I'm abashedly a fan ^^. 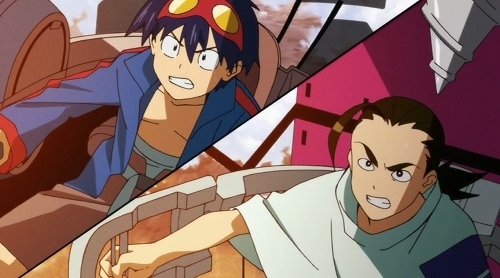 Partnerships: I really didn't think Rossiu/Simon stood a chance piloting Gurren Lagann together after the epicness that was Kamina/Simon, but they've turned out to be quite the formidable duo. Over the two weeks I've been watching this series, they've both come such a long way. 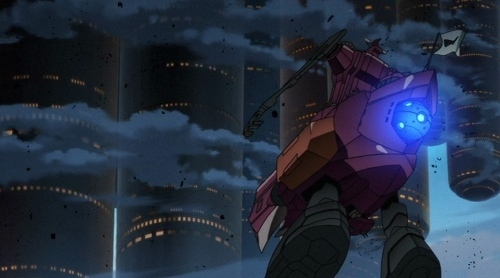 Unanswered questions: The Dai-Gurren crew have a sophisticated armada of Gunmen, but given they were all claimed from fallen enemies at some point, they're a hodgepodge mix of devices with different shapes, sizes, capabilities and epicness. When they meet their new human allies, not only do they have far more ships, but they're all uniform in shape, size, capability and epicness. Did these humans raid a factory? Cliff hanger: Several episodes ago I commented that the Spiral King looked as though he was standing in either a gigantic ship with columns, or a city. With the destruction of the Teppelin Capital, these giant columns with windows (slabs, if you will) proceed to fall from the sky, revealing a horrified facial expression. A homage to 2001: A Space Odyssey? 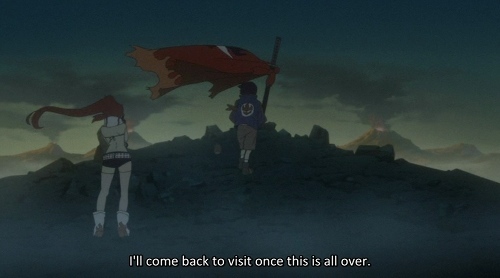 Heart tugging: Seeing Simon and Yoko looking onto their memorial for Kamina, with his sword and cape. I hope he's able to keep that promise. Conclusion: The known world is coming apart at the seams. What will be the implications? I have the feeling we're about to have our minds blown. Newer post ← Does nobody teach respect for The Timeline?